The dance of death. Credit: Wellcome Library, London. This is in many ways a project born of snoopiness. I have always loved to read about the mucky details of daily life, and the letters written to Sloane offer much by way of gore, suffering and family quarrels. But one thing has always frustrated me in my research: the size of Sloane’s correspondence (upwards of forty volumes, depending on what is counted). So many letters, so many stories, so often hard to find! The goal of this phase of the project is to complete the database, Sir Hans Sloane’s Correspondence Online, and to produce a series of microhistories about Sloane and his patients. While the collection remains indexed only by author (as it largely is still), it is difficult to navigate. The purpose of my database is to make it possible to search Sloane’s correspondence for details, such as people mentioned, social occasions, or specific illnesses. The database also makes it easier to find all references to a patient, whether made by a medical practitioner, friend or parent. This is when, to my way of thinking, things start to get really interesting. The family records of the Newdigates, for example, show that Sloane treated several members of the family. Elizabeth Newdigate’s letters to Sloane reveal a troubled young woman, beset by family strife that included two siblings with insanity, a lawsuit by the eldest son, and the daughters’ mysterious suit before Parliament (which was dropped) for their father’s “unnatural acts”. 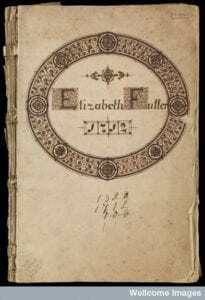 Reading the family references in Sloane’s letters alongside the Newdigate papers will be useful in uncovering the family’s dysfunction and the wider context of Elizabeth Newdigate’s illness letters. Gender, age and status all played key roles in the disputes. By reading cases like these alongside available family archives, I can use the medical letters as a point of entry into understanding the moments of illness within the wider context of patients’ and families’ lives. The database can also be used to trace relationships. Consider, for example, Sloane’s relationship with the Duchess of Albemarle. Although Sloane went to Jamaica with the Duke of Albemarle, he remained the Duchess’ household physician when he returned to London and even after the Duchess remarried the Duke of Montagu. The Pierreponts were the Duchess’ birth family, while the Cadogans were related to the Duke of Montagu: both families were regular patients of Sloane’s. In 1719, Sloane’s daughter even married into the Cadogan family. The letters from this group of related families provide insight into the workings of patronage, kinship, and Sloane’s career, as much as their collective health. Sloane himself is a fascinating subject of study. There are only a handful of letters about Sloane’s family and business in the correspondence, but there are also many small bits of scattered information: what he prescribed, others’ attitudes toward him, references to his opinions, details about property management, clues to his family and social life… His family life, too, was important for his career. He married Elizabeth Rose (née Langley), who was from a well-to-do London family and a widow of a wealthy Jamaican landowner; her wealth aided his ability to maintain the appearance of a gentleman (important in attracting wealthy clients) and to collect objects from around the world (which reinforced the image of him as a man of science). 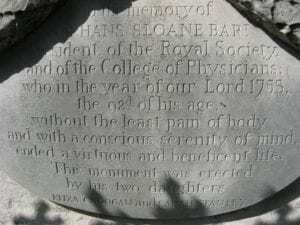 At the height of his career, Sloane was President of the Royal College of Physicians, President of the Royal Society and a royal physician—a man very much at the centre of the medical and scientific community, with opportunity to influence the health of the nation. Case histories such as these will allow me to examine the way in which social and political networks, state-building and power structures were reinforced in the everday life of the early modern household. And, of course, maximise my snoopiness.